Hospitals that serve a large population of minority patients were more likely to receive a penalty under the CMS' readmissions program even though they made greater reductions in readmission rates compared to their peers, according to a new Health Affairs study. The findings are in line with concerns by safety-net providers, which often serve large minority populations, that they are disproportionately dinged under the CMS' Hospital Readmissions Reduction program because they serve a higher proportion of patients with complex social risk factors. The study found that minority-serving hospitals decreased readmissions by 0.44% per quarter from April 2010 to September 2012, during the readmissions program's implementation period. All other hospitals decreased readmissions by 0.36% per quarter during that same timeframe. Despite this, 84.8% of minority-serving hospitals were penalized in fiscal year 2013 versus 68.8% of all other hospitals. Hospitals weren't penalized during the implementation period. The study defined 283 hospitals as minority-serving and the remaining 2,677 as non–minority serving. Minority-serving hospitals were more likely to be large hospitals, major teaching hospitals, public hospitals or located in the South. Minority-serving hospitals were more vulnerable to Medicare payment reductions because the CMS doesn't consider hospitals' individual improvement on readmissions when determining penalties. Instead the agency compares the average performance of all 3,000 hospitals in the dataset to each other, said Dr. José Figueroa, an author of the study and an instructor of medicine at Harvard Medical School. As a result, safety-net providers are compared to hospitals in affluent areas with less complex patient mixes. "Even if (a hospital) got much better, if they are still ranked in the bottom quartile, or near the bottom, they are still going to get penalized," he said. The CMS docks up to 3% of a hospital's Medicare payments. The CMS has responded to these concerns and the agency will assess penalties based on a hospital's performance relative to other hospitals with a similar proportion of patients who are dually eligible for Medicare and full-benefit Medicaid starting Oct. 1. The agency acknowledged that the change likely won't change much and that a large percentage of safety-net providers will still be penalized. Researchers also found that reductions in readmission rates have largely plateaued for both minority-serving hospitals and their peers since October 2012, which is when the penalties went into effect. Readmissions among minority-serving hospitals only decreased by 0.12% per quarter from October 2012 to December 2014 while readmissions declined by 0.11% per quarter for all other hospitals. Figueroa said hospitals had a few years to prepare for the CMS program so they probably made significant investments to address readmission rates before the penalties went into effect. This would explain why significant reductions in readmissions were seen in the implementation period and have slowed during the penalty period. Other studies have also found that reductions in readmissions have flattened overall in recent years, prompting some health policy experts to suggest the CMS retire the program. "Maybe the plateauing is happening because we have reached all the gains of the program," Figueroa said. A bright spot the study highlighted is that the CMS' penalty program significantly narrowed the disparity in readmissions rates between black and white patients. Before the CMS program, black patients were 20% more likely to be readmitted to the hospital than white patients. 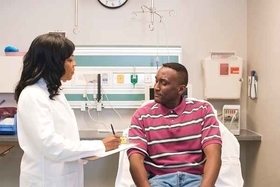 Since the program went into effect, the readmission rate for black patients has declined from 23.9% in 2007 to 18.9% in 2014, which is close to the 17.7% readmission rate white patients experienced in 2014. "There are very programs that are associated with decreases in disparities, so it's reassuring that is happening," Figueroa said. In a statement, Akin Demehin, director of policy at the American Hospital Association, said the Health Affairs study "adds to the body of research showing that readmissions performance is associated with a variety of socio-economic factors, especially factors like income and dual-eligibility for Medicare and Medicaid that reflect access to resources that promote recovery following hospitalization." He added the AHA is "pleased" with CMS' adjustment to the program that will factor in a hospital's dual-eligible population beginning in October.